I can remember times in my life when I prayed a prayer that would have sounded an awful lot like Psalm 69. There was the time when I was 12 years old and my dad took a job in another town. That meant moving away from my school and friends. I was scared in a new, unfamiliar place. It took time, a couple of years – what seemed like forever to a 12-year-old – for me to feel at home in that new place. The words of our Psalm, though I could not have recited them at the time, would have resonated with me: “I sink in deep mire, where there is no foothold…I am weary with my crying…my eyes grow dim with waiting…” I remember crying in my pillow some nights. And when these kinds of things happen, we might wonder what a person of faith is supposed to do. I’ve known people in my life for whom this question of what to do, what to say, even what to THINK, when troubles arise in life has led them to flee from their faith altogether. Some just couldn’t accept that the God they learned about in Sunday school could possibly exists alongside such pain…and so they gave up on God. And still others just flat out decided that their faith was no help when the chips were down, and so they drifted away from God. So…low times, times when people are in physical or emotional pain, are very important times where faith is concerned. And…it turns out that this book called the Psalms was written by real people who lived real lives – people who experienced joy and pain and who tried to figure out how to relate to God and what it means to find happiness or blessedness in life. And these people wrote a ‘particular’ type of psalm called a psalm of lament. And these psalms of lament help us, both as prayers prayed to God in difficult times and as a guide to help us work out what to do in the difficult times, so that we’re more likely to have our faith strengthened than fall apart. And Psalm 69, our sermon text for today, is one of those psalms of lament. As I read the opening verses of Psalm 69, one thing that really struck me was how difficult it was to figure out exactly the problem that the psalmist was facing. 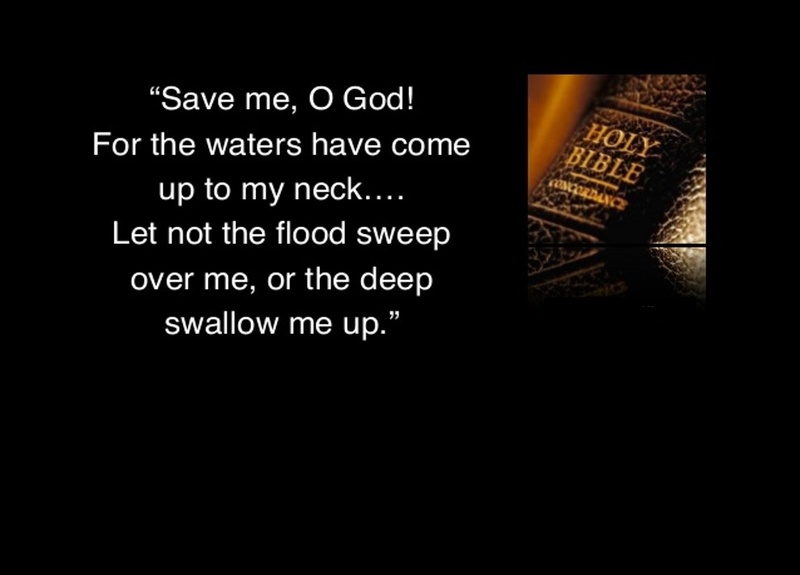 I mean, it starts out with drowning – “Save me, O God! For the waters have come up to my neck.” Was this a literal drowning or a metaphorical drowning – you know, how we say, ‘I’m in over my head’ to describe those times we feel overwhelmed? And then, who were these other people who hated the psalmist without reason – Those whom the psalmist calls, “My enemies who accuse me falsely?” Was this back-stabbing, or gossip, or outright persecution? And then there’s verse 5: ‘You, God, know my folly; my guilt is not hidden from you.” Is it possible that the reason for the psalmist’s distress is his own sin, or perhaps, his own foolish choices? I think all this is intentionally presented in a vague kind of way…so we can all relate to it, so we can CONNECT with the psalmist’s experience. I mean, these psalms are here in the Bible to help us. First, this psalm reminds us that there are people who have gone through what we’re going through, and in prayer they found the strength to get through it. There are times when I’ve struggled to find words to pray, and I’ve used the words of the psalms as my prayer to God. In the low times of life, it’s important for us to continue to pray, even if our prayer is complaining to God – God understands, God can take it. When words or phrases are repeated in the Bible, it’s like the writer is trying to get our attention, because it’s something important. The phrase, “steadfast love,” in the Bible, means that quality of God that will always hold us, that sure love of God that will never let us go, even in the midst of the worst that we face. For the ancient Israelites, God’s steadfast love was the thing that made God reliable and trustworthy. Not even their sin could destroy God’s steadfast love. And then, here’s the important thing for us to see. By this affirmation of trust in God’s steadfast love, the psalmist is putting his, or her, situation into God’s hands. In other words, the psalmist is saying, “I trust you, O God, that according to your steadfast love you will act. You, O God, may deliver me from this situation, or you may give me the strength to endure this situation, or you may enable me, in my pain, to help someone else in their distress. But I trust, O God, in your love, and I put my life into your hands. Trusting God is the way through; trusting God makes all the difference. 1. Cry out to God. In time of distress, keep praying, keep the focus of your heart on God. 2. Remember, even if your prayer is to complain to God, he understands. He can take it..
3. And then…trust that God hears and will answer and will act. And when I say “trust,” I mean, put it into God’s hands; trust, that WHATEVER the outcome, God will be with you, and God will never leave you or forget you. Ultimately, the purpose of a psalm of lament is to help the worshipper – that’s US – to move from spiritual pain to spiritual joy. That’s what God wants for us when we’re in distress…a movement from suffering to joy – joy in knowing that we belong to God and that we are held in his love, always.